For other people with similar names, see Aaron Swartz (actor) or Aaron Schwartz (disambiguation). On January 6, 2011, Swartz was arrested by MIT police on state breaking-and-entering charges, after connecting a computer to the MIT network in an unmarked and unlocked closet, and setting it to download academic journal articles systematically from JSTOR using a guest user account issued to him by MIT. Federal prosecutors later charged him with two counts of wire fraud and eleven violations of the Computer Fraud and Abuse Act, carrying a cumulative maximum penalty of $1 million in fines, 35 years in prison, asset forfeiture, restitution, and supervised release. He committed suicide while under federal indictment for his alleged computer crimes. Swartz declined a plea bargain under which he would have served six months in federal prison. 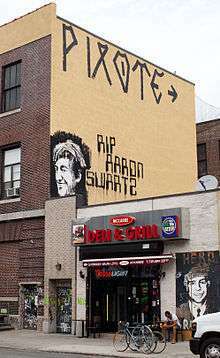 Two days after the prosecution rejected a counter-offer by Swartz, he was found dead in his Brooklyn apartment, where he had hanged himself. In June 2013, Swartz was inducted posthumously into the Internet Hall of Fame. At age 13, Swartz won an ArsDigita Prize, given to young people who create "useful, educational, and collaborative" noncommercial websites. At age 14, he became a member of the working group that authored the RSS 1.0 web syndication specification. Swartz attended Stanford University. During his freshman year, Swartz applied to Y Combinator's very first Summer Founders Program proposing to work on a startup named Infogami designed as a flexible content management system to allow the creation of rich and visually interesting websites or a form of wiki for structured data. After working on Infogami with co-founder Simon Carstensen over the summer of 2005, Aaron opted not to return to Stanford, choosing instead to continue to develop and seek funding for Infogami. When Infogami failed to find further funding, Y-Combinator organizers suggested that Infogami merge with Reddit, which it did in November 2005 to form a new firm Not A Bug devoted to promoting both products. Although both projects initially struggled to gain traction, Reddit began to make large gains in popularity in 2005 and 2006. One of his more notorious works that supports activism is Deaddrop, now renamed to SecureDrop, a platform for secure communication between journalists and sources (whistleblowers) used at several news organizations, including ProPublica, The Intercept, The Guardian, and The Washington Post. Author Cory Doctorow, in his novel, Homeland, "dr[ew] on advice from Swartz in setting out how his protagonist could use the information now available about voters to create a grass-roots anti-establishment political campaign." In an afterword to the novel, Swartz wrote, "these [political hacktivist] tools can be used by anyone motivated and talented enough.... Now it's up to you to change the system. ... Let me know if I can help." 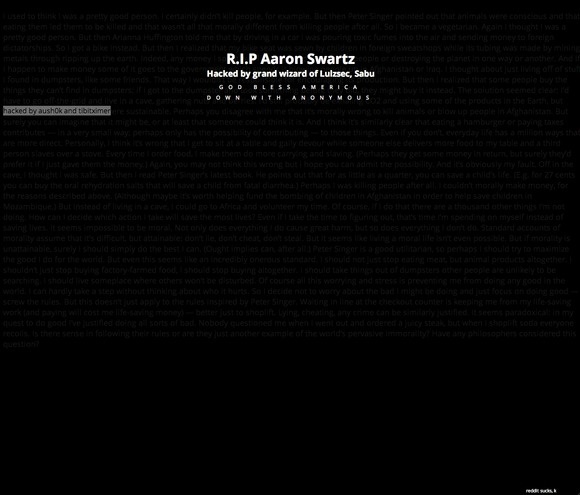 ^ Swartz, Aaron (May 21, 2012). "How we stopped SOPA" (video). Keynote address at the Freedom To Connect 2012 conference. New York: Democracy Now!. [T]he ‘Combating Online Infringement and Counterfeiting Act' ... was introduced on September 20th, 2010.... And [then] it began being called PIPA, and eventually SOPA. ^ Aaron Swartz (interviewee) & Amy Goodman (May 21, 2012). Freedom to Connect: Aaron Swartz (1986–2013) on victory to save open Internet, fight online censors (Video). N.Y.C. : Democracy Now. PACER was charging 8 cents per page for information that Carl Malamud, who founded the nonprofit group Public.Resource.Org, contended should be free, because federal documents are not covered by copyright. The fees were "plowed back to the courts to finance technology, but the system [ran] a budget surplus of some $150 million, according to court reports," reported The New York Times. PACER used technology that was "designed in the bygone days of screechy telephone modems ... put[ting] the nation's legal system behind a wall of cash and kludge." Malamud appealed to fellow activists, urging them to visit one of 17 libraries conducting a free trial of the PACER system, download court documents, and send them to him for public distribution. 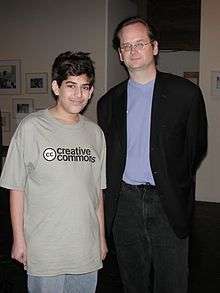 Swartz participated very actively as an editor at the English Wikipedia. In 2006, he ran unsuccessfully for the Wikimedia Foundation's Board of Trustees. In 2006, Swartz wrote an analysis of how Wikipedia articles are written, and concluded that the bulk of the actual content comes from tens of thousands of occasional contributors, or "outsiders", each of whom may not make many other contributions to the site, while a core group of 500 to 1,000 regular editors tend to correct spelling and other formatting errors. According to Swartz: "the formatters aid the contributors, not the other way around." His conclusions, based on the analysis of edit histories of several randomly selected articles, contradicted the opinion of Wikipedia co-founder Jimmy Wales, who believed the core group of regular editors were providing most of the content while thousands of others contributed to formatting issues. Swartz came to his conclusions by counting the total number of characters added by an editor to a particular article—while Wales counted the total number of edits. It was reported after his death that around 2006, Swartz acquired the Library of Congress's complete bibliographic dataset: the library charged fees to access this, but as a government document, it was not copyright-protected within the USA. By posting the data on OpenLibrary, Swartz made it freely available. The Library of Congress project was met with approval by the Copyright Office. Other sources show that the file was donated to the Internet Archive from Plymouth State University's library system, Scriblio. Regardless of the source, the file became the basis for the Open Library, with Swartz as chief designer. In 2011–2012, Swartz and Kevin Poulsen designed and implemented DeadDrop, a system that allows anonymous informants to send electronic documents without fear of disclosure. In May 2013, the first instance of the software was launched by The New Yorker under the name Strongbox. The Freedom of the Press Foundation has since taken over development of the software, which has been renamed SecureDrop. The authorities said Swartz downloaded the documents through a laptop connected to a networking switch in a controlled-access wiring closet at MIT. The door to the closet was kept unlocked, according to press reports. When discovered, JSTOR claims that its employees initially placed a video camera in the room to film Swartz and left Swartz's computer untouched. Once video was captured of Swartz, the download was stopped and Swartz identified. Rather than pursue a civil lawsuit against him, in June 2011 it reached a settlement wherein he surrendered the downloaded data. The federal prosecution involved what was characterized by numerous critics such as former Nixon White House counsel John Dean as an "overcharging" 13-count indictment and "overzealous" prosecution for alleged computer crimes, brought by the U.S. Attorney for Massachusetts Carmen Ortiz. Mitch Kapor posted the statement on Twitter. Tom Dolan, husband of U.S. Attorney for Massachusetts Carmen Ortiz, whose office prosecuted Swartz's case, replied with criticism of the Swartz family: "Truly incredible that in their own son's obit they blame others for his death and make no mention of the 6-month offer." This comment triggered widespread criticism; Esquire writer Charlie Pierce replied, "the glibness with which her husband and her defenders toss off a ‘mere' six months in federal prison, low-security or not, is a further indication that something is seriously out of whack with the way our prosecutors think these days." Aaron Swartz's legacy has been reported as strengthening the "open access" to scholarship movement. In Illinois, his home state, Swartz's influence led state university faculties to adopt policies in favor of open access. On January 11, 2014, marking the first anniversary of his death, a sneak preview was released from The Internet's Own Boy: The Story of Aaron Swartz, a documentary about Swartz, the NSA and SOPA. The film was officially released at the January 2014 Sundance Film Festival. Democracy Now! covered the release of the documentary, as well as Swartz's life and legal case, in a sprawling interview with director Brian Knappenberger, Swartz's father and brother, and his attorney. The documentary is released under a Creative Commons License; it debuted in theaters and on-demand in June 2014. Congressman Grayson states that Killswitch is "One of the most honest accounts of the battle to control the Internet – and access to information itself.". Richard von Busack of the Metro Silicon Valley, writes of Killswitch, "Some of the most lapidary use of found footage this side of The Atomic Café". Fred Swegles of the Orange County Register, remarks, "Anyone who values unfettered access to online information is apt to be captivated by Killswitch, a gripping and fast-paced documentary." Kathy Gill of GeekWire asserts that "Killswitch is much more than a dry recitation of technical history. Director Ali Akbarzadeh, producer Jeff Horn, and writer Chris Dollar created a human centered story. A large part of that connection comes from Lessig and his relationship with Swartz." On the night of January 18, 2013, MIT's e-mail system was taken out of action for ten hours. On January 22, e-mail sent to MIT was redirected by hackers Aush0k and TibitXimer to the Korea Advanced Institute of Science & Technology. All other traffic to MIT was redirected to a computer at Harvard University that was publishing a statement headed "R.I.P Aaron Swartz," with text from a 2009 posting by Swartz, accompanied by a chiptunes version of The Star-Spangled Banner. MIT regained full control after about seven hours. In January 2015, two years after Swartz’s death, the White House declined both petitions. On March 22, Senator Al Franken wrote Holder a letter expressing concerns. Franken said, "charging a young man like Mr. Swartz with federal offenses punishable by over 35 years of federal imprisonment seems remarkably aggressive — particularly when it appears that one of the principal aggrieved parties ... did not support a criminal prosecution." Following Aaron's example Kazakh computer scientist and neuro-researcher Alexandra Elbakyan founded the website Sci-Hub. Sci-Hub gives access to paywalled articles through its repository without paying, as of 2016 holding over 50 million articles. Elbakyan has frequently been compared to Swartz in her solid criticism of paywalls and her dedication to Sci-Hub which she says will not be brought down regardless of lawsuits. Swartz, Aaron; Lucchese, Adriano (November 2014), Raw Thought, Raw Nerve: Inside the Mind of Aaron Swartz ( PDF/ePub), New York, NY: Discovery Publisher . Gruber, John; Swartz, Aaron (December 2004), Markdown definition, Daring Fireball . 1 2 Grehan, Rick (August 10, 2011). "Pillars of Python: Web.py Web framework". InfoWorld. Web.py, the brainchild of Aaron Swartz, who developed it while working at Reddit.com, describes itself as a ‘minimalist’s framework.’ ... Test Center Scorecard: Capability 7; Ease of Development 9; Documentation 7; ...; Overall Score 7.6, Good. 1 2 "Lab Fellows 2010–2011: Aaron Swartz". Edmond J. Safra Center for Ethics. Harvard University. 2010. Archived from the original on 2013-05-29. During the fellowship year, he will conduct experimental and ethnographic studies of the political system to prepare a monograph on the mechanisms of political corruption. ↑ US Attorney's Office District of Massachusetts (July 19, 2011). "Alleged Hacker Charged With Stealing Over Four Million Documents from MIT Network". Press release. Archived from the original on 2012-05-26. Retrieved January 17, 2013. 1 2 "Aaron Swartz, Tech Prodigy and Internet Activist, Is Dead at 26". Time. January 13, 2013. Retrieved January 13, 2013. 1 2 Press release from the Internet Hall of Fame. ↑ Swartz, Aaron (January 14, 2002). "It's always cool to run...". Weblog. Aaron Swartz. I would have been in 10th grade this year.... Now I'm taking a couple classes at a local college. ↑ "Second ArsDigita Prize 2000 Finalists and Winners". December 1, 2001. Archived from the original on December 1, 2001. Retrieved 2016-03-06. 1 2 Ryan, Singel (September 13, 2005). "Stars Rise at Startup Summer Camp". Wired. Retrieved 2014-12-19. ↑ "Aaron Swartz's Jottit has been officially released". Reddit. 2007. Retrieved 2015-10-20. ↑ "The team". Watchdog.net. Founder Aaron Swartz ... We’re funded by a grant from the Sunlight Network and the Sunlight Foundation. 1 2 Swartz, Aaron (July 2008). "Guerilla Open Access Manifesto" (PDF). Internet Archive. We need to buy secret databases and put them on the Web. We need to download scientific journals and upload them to file sharing networks. ↑ "ProPublica SecureDrop Server". ProPublica. Retrieved 2016-05-27. ↑ "Become a source". The Intercept. Retrieved 2016-05-27. ↑ "The Guardian SecureDrop Server". The Guardian. Retrieved 2016-05-27. ↑ "SecureDrop - The Washington Post". The Washington Post. Retrieved 2016-05-27. 1 2 3 Wagner, Daniel; Verena Dobnik (January 13, 2013). 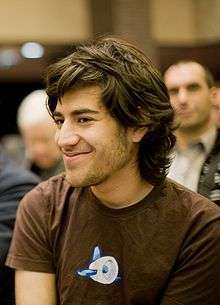 "Swartz' death fuels debate over computer crime". Associated Press. JSTOR's attorney, Mary Jo White — formerly the top federal prosecutor in Manhattan — had called the lead Boston prosecutor in the case and asked him to drop it, said Peters. ↑ Malamud, Carl (January 24, 2013). Aaron’s Army (Speech). Memorial for Aaron Swartz at the Internet Archive. San Francisco. 1 2 3 Swartz, Aaron (September 4, 2006). "Who Writes Wikipedia?". Raw Thought. Retrieved January 12, 2013. ↑ Charlton, Alistair (October 16, 2013). "Aaron Swartz-Designed Whistleblower Tool SecureDrop Launched by Press Freedom Foundation". International Business Times. IBT Media. 1 2 3 MacFarquhar, Larissa (March 11, 2013). "Requiem for a dream: The tragedy of Aaron Swartz". The New Yorker. [Swartz] wrote a script that instructed his computer to download articles continuously, something that was forbidden by JSTOR's terms of service.... He spoofed the computer's address.... This happened several times. MIT traced the requests to his laptop, which he had hidden in an unlocked closet. 1 2 Cohen, Noam (January 20, 2013). "How M.I.T. ensnared a hacker, bucking a freewheeling culture". The New York Times. p. A1. (registration required (help)). ‘Suspect is seen on camera entering network closet' [in an unlocked building].... Within a mile of MIT ... he was stopped by an MIT police captain and [U.S. Secret Service agent] Pickett. ↑ Peters, Justin (February 7, 2013). "The Idealist: Aaron Swartz wanted to save the world. Why couldn't he save himself?". Slate. N.Y.C. 6. The superseding indictment ... claimed that Swartz had ‘contrived to break into a restricted-access wiring closet at MIT.' But the closet door had been unlocked—and remained unlocked even after the university and authorities were aware that someone had been in there trying to access the school's network. ↑ Dean, John. "Dealing With Aaron Swartz in the Nixonian Tradition: Overzealous Overcharging Leads to a Tragic Result". Verdict from Justia. Retrieved 2016-05-28. ↑ Boeri, David (February 20, 2013). "Ortiz Under Fire: Critics Say Swartz Tragedy Is Evidence Of Troublesome Pattern". WBUR. Retrieved 2014-05-16. ↑ Landergan, Katherine (January 14, 2013). "US District Court drops charges against Aaron Swartz — MIT – Your Campus". Boston.com. Retrieved January 23, 2013. ↑ "Aaron Swartz Tribute: Hundreds Honor Information Activist". Huffingtonpost.com. January 19, 2013. Retrieved January 20, 2013. ↑ Guy, Sandra (January 15, 2013). "Aaron Swartz was 'killed by government,' father says at funeral". Chicago Sun-Times. Archived from the original on 2014-08-24. Swartz's father ... said that at a school event, 3-year-old Aaron read to his parents while all of the other parents read to their children. ↑ Stout, Matt, Ortiz: We never intended full penalty for Swartz, The Boston Herald, January 17, 2013.. Retrieved January 17, 2013. ↑ Barnes, James, Hacker's suicide linked to 'overzealous' prosecutors, The Global Legal Post, 15 January 2013.. Retrieved January 17, 2013. ↑ Dobuzinskis, Alex; P.J. Huffstutter (January 13, 2013). "Internet activist, programmer Aaron Swartz dead at 26". Reuters. That belief — that information should be shared and available for the good of society — prompted Swartz to found the nonprofit group Demand Progress. ↑ Zak, Dan (July 26, 2013). "'Printing Out the Internet' exhibit is crowdsourced work of art". The Washington Post. Retrieved August 20, 2013. ↑ "The Internet's Own Boy: The Story Of Aaron Swartz – Festival Program". Sundance Institute. Archived from the original on 2014-03-25. ↑ "PDF Tribute". Retrieved January 15, 2013. ↑ Vivalt, Eva (January 12, 2013). "In memoriam". Aid Economics. Eva Vivalt. Archived from the original on 2013-03-13. ↑ Kopstein, Joshua (March 13, 2013). "Aaron Swartz to receive posthumous 'Freedom of Information' award for open access advocacy". The Verge. Retrieved March 24, 2013. ↑ New, Jake (March 26, 2013). "Journal's Editorial Board Resigns in Protest of Publisher's Policy Toward Authors". The Chronicle of Higher Education. Retrieved 2015-05-30. ↑ "It was just days after Aaron Swartz' death, and I was having a crisis of conscience about publishing in a journal that was not open access.". Feral Librarian. Retrieved November 19, 2014. ↑ Swartz, Aaron. "If I get hit by a truck...". Archived from the original on 2003-01-17. Retrieved 2016-05-29. ↑ "Hackers take over sentencing commission website". Associated Press. January 26, 2013. ‘Two weeks ago today, a line was crossed,' the statement said. ↑ "homepage". Swartz Review. MIT. January 23, 2013. Archived from the original on 2013-02-06. IS&T has created this web site so [community members] can suggest questions and issues to guide the review... What questions should MIT be asking at this stage of the Aaron Swartz review? ↑ "Petition: "Remove United States District Attorney Carmen Ortiz from office for overreach in the case of Aaron Swartz."". Wh.gov. January 12, 2013. Retrieved January 20, 2013. ↑ "Fire Assistant U.S. Attorney Steve Heymann". Wh.gov petition. January 12, 2013. Retrieved January 29, 2013. ↑ H.R. 2454; H.R. 2454 at GovTrack; H.R. 2454 Archived November 12, 2013, at the Wayback Machine. Archived November 12, 2013, at the Wayback Machine. at OpenCongress. S. 1196; S. 1196 at GovTrack; S. 1196 Archived November 12, 2013, at the Wayback Machine. at OpenCongress. ↑ "White House Issues Public Access Directive". Publishers Weekly. February 22, 2013. Retrieved 2013-05-28. ↑ Boyko, Brian (January 11, 2014). "It Begins. Thank you.". Retrieved September 5, 2014. 1 2 Murphy, Kate (2016-03-12). "Should All Research Papers Be Free?". The New York Times. ISSN 0362-4331. Retrieved 2016-08-23. ↑ "A spiritual successor to Aaron Swartz is angering publishers all over again". Retrieved 2016-08-23. ↑ "There was a third 'co-founder' of reddit", Today I Learned, Reddit, October 18, 2010, Aaron isn’t a founder of reddit.